And just like that, Christmas is over and the new year will be upon us. I always feel slightly sad during this transition time. Time passes so quickly so I never feel quite ready to let the year go. Documenting something as simple as my daily outfits seems so trivial but, looking back at these outfits reminds me of a specific day and mood. I love remembering certain moments that otherwise might have become lost in the fray. I came across 10 Questions to Ask Yourself on Meg Biram's blog and thought these would be perfect to answer as I close out 2014. Here are my answers...feel free to share any of your answers, too! 1. What was the most important thing you learned about yourself in 2014? How strong of a person I have grown to be. Each year, I feel more confident in myself and my capabilities. This year, the husband and I encountered challenges as a family but we have conquered them together. If I didn't believe in myself, I don't believe that we could have gotten through those times as easily. It would have been a struggle to determine how I felt and then try to figure out things together. I can now voice my opinion knowing my stance is firm. Except when it comes to food. I'm all over the place with food. 2. What did you make/create/build this year? Without meaning to sound corny or cliché, my biggest creation is...my baby! I realize I don't yet have this baby in my arms to hold but knowing this little person is growing inside of me is one of the most amazing creations. I never realized this feeling could be so strong. 3. What did you overcome this year? I gave up some of my emotional baggage. I think that's the worst to carry around. Until you face them, you can't really move forward. 4. What were your daily habits and rituals? I always started my day with a cup of coffee (a latte made by my husband). But, when I learned I was pregnant, I chose to cut that habit. So lately, my habit has become to start my day with a caffeine-free tea. I also have a (bad) habit of always checking Instagram when I wake up. 5. What book or movie deeply affected you? Why? Hmm...this is actually a tough one. I didn't get a chance to read or watch as many movies as I usually do in a year. But, one of the standouts I read recently was The Art of Racing in the Rain. This book was recommended to me and I found it to be such a unique tale. I didn't think I would like as much as I did. But, the story was heartwarming and heart wrenching. 6. What did you focus on most? I focused on my family. In 2013, I remember feeling somewhat lost and I wanted to re-focus my attention on things that mattered. I feel I made a strong effort in 2014 in that regard. 7. What was your favorite compliment you received this year? When my husband said I was cute. For no reason than to just say it to me. 8. If you could go back and change something, what would you do differently? Frankly, nothing. This is not because I think 2014 was perfect but if I didn't encounter what I did then things wouldn't be as they are now. Although, if timing worked out then I would have wanted to travel more. 9. What did you do for the first time this year? I went to my first hockey game at the start of 2014 with my husband. I got hooked. 10. What was the best purchase you made this year? When I think back at 2014, I didn't make any huge purchases. The husband and I focused a lot on home goods so I really love those purchases. Oh, I I also love my pre-order for a Mansur Gavriel tote...but, that hasn't arrived yet so does that count? And that's a wrap on 2014! Have a wonderful start to 2015 and be safe. Cheers! Love this review - you always have the most stylish outfits! Happy New Year darling! Damn, I finished my comment and it disappeared.. I will try again, and how this is not a duplicate! Love the outfit recaps, since I am new follower, these were new to me, and might impressive. I love the way you change things up and dont over rely on certain pieces or styles.This speaks to me of the emotional growth you have achieved this year! This will be a profoundly wonderful year, for you, I predict, The baby, will change and deepen your life in ways that will take your breathe away . sending love for the New Year! Loved seeing a recap of all your outfits. You are gorgeous! Loved these questions. What a great round up and way to close out your year which has been full of new life adventures. Have a wonderful healthy, happy, love filled 2015 Nancy! I feel the same way in that I feel more confident every year. I loved these questions that you answered to close out the year. Happy New Year! This is a great post! I really love your style and I can't wait to see more of you this 2015. This was such a great recap!! 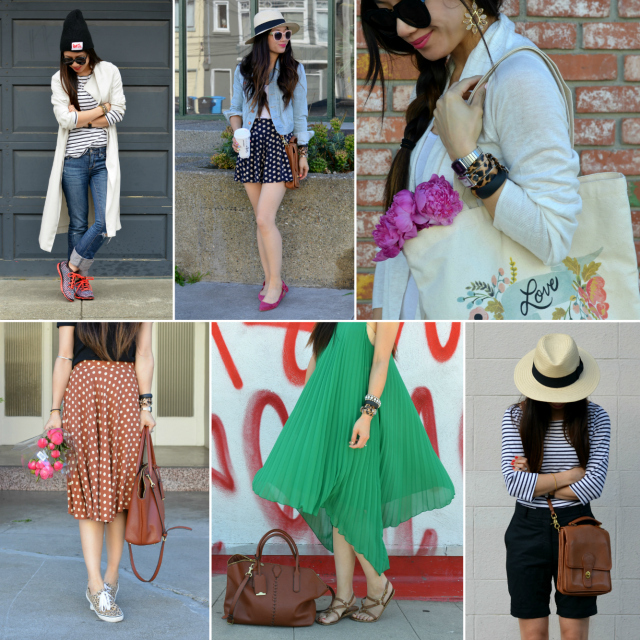 You have such great style and I loved looking through all of these different outfits. Love your style so much!! Happy New Year! Nancy, this post was beautiful. I love that you and your husband work through things TOGETHER. That shows that you guys are committed to one another and LOVE one another. There's too many times when relationships are lopsided. You have so much to look forward to in 2015. You are so blessed and will be a fabulous mother. God bless you, your hubby and baby. Your style is always inspiring. Congratulations on the baby :) Happy new year! Cute outfits! Really love how your style your skirts. Stunning looks darling! Happy New Year! Such a great roundup of the year! Happy New Year and congrats on the baby! This is such a cute round up! I love all the looks you picked! Absolutely stunning round-up! Everything looks lovely!